With midterms looming, Cox and state employees talk election security. Russian hackers targeted the election systems of 21 states in the 2016 presidential election. Utah, unlike its neighbors Colorado and Arizona, was not among those attacked. But that doesn’t mean the Beehive State isn’t subjected to a constant onslaught by foreign keyboard warriors eager to compromise its elections and statewide systems, Lt. Gov. Spencer Cox said Tuesday. Cox, Director of Elections Justin Lee and Director of Election Systems Mark Mitchell met with reporters at the Capitol to discuss how the state is preparing for the Nov. 6 midterms. Cox said his office regularly gets questions about election security, in light of reporting by national media that suggests the integrity of the country’s elections is at stake. Cox said he was especially worried about Utah being targeted during the upcoming midterms because Mitt Romney—a former presidential candidate who spoke out against Russia while he was on the campaign trail in 2012—is running for Senate. Shortly after learning Romney was running, Cox wrote a letter to his elections staff and the Utah Department of Technology Services (DTS) to convey his concern. “Our No. 1 priority had to be upgrading and making sure that we were prepared for whatever might come our way,” he said. The lieutenant governor stressed the difference between voting systems that are online and connected to the internet, like the voter registration database and the state’s website that posts election results, and voting systems like voting and tabulation machines, which “are never in any way connected” to the web. “We are doing more than we have ever done before,” Cox said of Utah’s cybersecurity, explaining that his office has taken “significant steps” to know what hackers are doing and prevent them from getting into state systems. 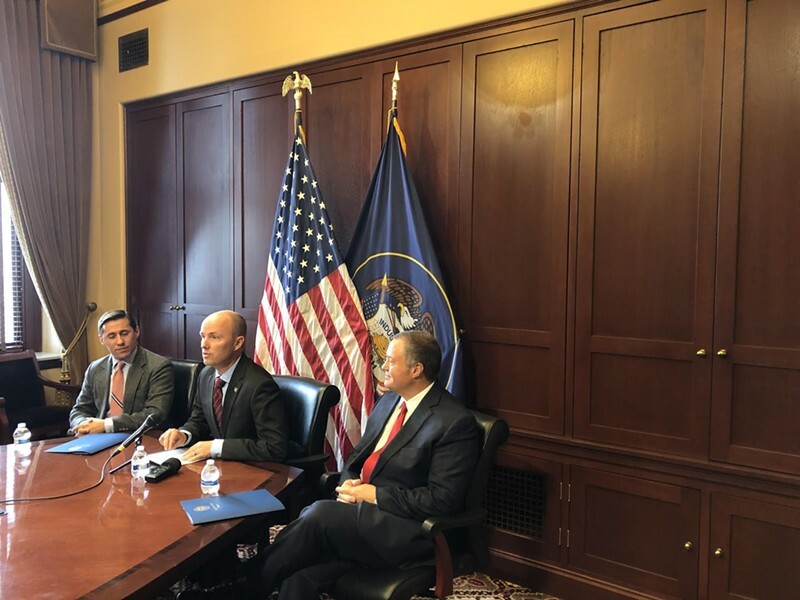 Cox said his office is coordinating with DTS and the Department of Homeland Security, the FBI and county clerks and officials across Utah to ensure its elections are safe from cyber attacks. The state has also installed new monitoring software and invested in paper-based voting machines. “One of the things we know is paper ballots happen to be more secure than electronic ballots. Most of the state has moved to that,” Cox said, estimating that about 90 percent of votes in the midterms will be cast on paper ballots. Lee said funding for the security upgrades and enhancements came from the state and federal government. “We’ve got the money. Not all of it has been spent, but we’ve got plans to spend all of it in the next few years,” he said. And despite inconsistencies between President Donald Trump and his administration on the threat of foreign interference in U.S. elections, Lee said the feds have been very supportive of Utah’s efforts to shore up its elections equipment to protect itself from hackers. “Honestly, this is a situation where the federal government is giving us more resources than we even know what to do with sometimes,” he said.